The fight against Portuguese hegemony in Portuguese Guinea was led by the African Party for the Independence of Guinea and the Cape Verde Islands (PAIGC) in Guinea, where PAIGC headquarters operated openly. Guerrillas were trained by Cuban and possibly Soviet instructors. Guinean President Sekou Toure blamed Portugal for attacks on his life in 1969 and early 1970. The Guinean militia was alerted to a perceived threat from Portuguese Guinea. Armed groups landed near Conakry, burned buildings, freed some political prisoners, and were repulsed. Toure, charging a Portuguese invasion, appealed for UN troops. Two further landings occurred. Several African states and the OAU SYG offered military assistance, which proved unnecessary. A UNSC fact-finding team later identified the invaders as Guinean dissidents and Portuguese forces commanded by white Portuguese (350-400 in all) whose purpose was to overthrow Toure, put dissidents in power, weaken the PAIGC and free Portuguese prisoners. The UNSC endorsed the team's report despite Lisbon's denials, and on December 8 voted to condemn Portugal (the US, UK, France and Spain abstaining). On December 11 the OAU condemned NATO countries' complicity with Portugal and offered action to strengthen anti-Portuguese guerrillas. 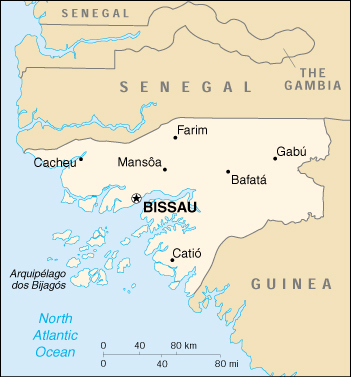 With the collapse of the Portuguese dictatorship, Portuguese Guinea became the independent country of Guinea Bissau in the fall of 1974, and was granted diplomatic recognition by Guinea.